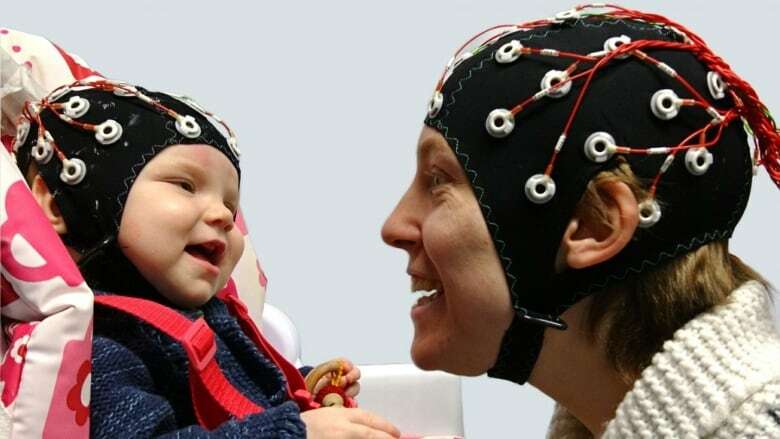 Using EEG technology, researchers found that if eye contact is made, infants can synchronize their brainwaves with an adult. Previous research has demonstrated that babies and parents achieve synchronization in a number of different ways. The most outward is emotional synchronization — an infant can pick up then take on a mother's happiness or sadness, for example. It was known that heartbeats can become synchronized at various points in a baby's development. Also, earlier research had shown that adults can synchronize their brainwaves when they are talking to each other. The more they are in synch, the better the communication. They key to that type of synchronization is eye contact, so scientists including Dr. Victoria Leong, a developmental cognitive neuroscientist from The University of Cambridge in England, hypothesized that this would work with babies as well. The experiment involved 36 babies divided into two groups. The average age of the babies was nine months. The first group watched a woman singing nursery rhymes on video. The woman's head was positioned in three different ways: direct eye contact, averted gaze, and turned head but gaze still direct. Her brainwaves were pre-recorded, but then matched to the baby's brainwaves in all three positions. They looked for fluctuation of groups of neurons that create a pattern of oscillation. In the second phase of the experiment, the second group of babies were watching the same woman singing nursery rhymes in person. Both the singer and the babies were monitored simultaneously. In both phases of the experiment, the infant's brainwaves were most in sync with the adult when direct eye contact was made. In phase one, the direction of the synchronization was one way because the singer's brain activity was pre-recorded. But in phase two, the researchers found that the direction of the synchronization was both ways — the baby was able to influence the adult's brainwaves. This happened even when the adult looked away, but the baby kept on making eye contact — they call this intention to communicate. To test this, they timed the baby's vocalizations while making eye contact. They found that babies made a greater effort to produce more and longer vocalizations when direct eye contact was made. In this case, the synchronization is about the baby's intention to communicate, which is important to their overall development. Trump vows that the U.S. will go back to the moon, but how? Are there rainbows in deep space?